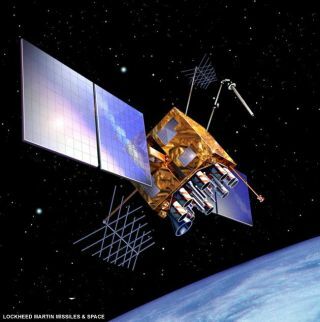 Artist rendering of a GPS satellite launched in 2003 to replace another in the aging fleet. In bad weather, it can be hard to tell where you are. It turns out that your GPS unit may not be entirely sure, either, if the weather in space is bad. It is now known that space weather -- specifically electrical disturbances in our planet's ionosphere -- can throw off the accuracy of GPS units appreciably. Scientists are working to remedy the situation. The ionosphere is the layer of the atmosphere extending upward from a height of about 60 miles. Its tenuous gas is electrically charged enough to affect radio signals. During sunspot activity, the inaccuracy can exceed 32 yards (30 meters). "People think the problem has been solved, but they have been lulled because the 11-year sunspot cycle is currently at its minimum," she told SPACE.com. "That will change in about four years." Excited by sunspots, the ionosphere has been known to produce "fingers" of heavy ionization nearly 150 miles wide extending from Florida across Canada to the North Pole, she said. Space storms, sometimes caused by sunspot activity, are also known to zap cell towers, causing dropped calls. Strong solar flares can disrupt all types of communications on Earth, including GPS, and even disable satellites. Coster, who discussed the issue of GPS accuracy in a recent special issue of Space Weather, a journal published by the American Geophysical Union, noted that barges traveling through inland canals have only about 16 feet (5 meters) of clearance, so relying on GPS navigation during heavy sunspot activity could lead to accidents. Offshore oil rigs also heavily rely on GPS for precise drilling, she noted. During the next 10 years, scientists should be able to generate near-real-time predictions of ionospheric weather that will let GPS users correct their units, she said. But after 2018, it is expected that all GPS units will be using two frequencies, and after that the situation should take care of itself, she added.